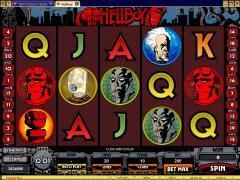 Hellboy is a branded slot game from Microgaming developed in conjunction with Dark Horse Comics. It features the popular comic book hero from the nineties. The slot game opens with an electrifying introductory clip that introduces the characters and also the features of the game. The Hellboy Logo is the wild symbol. Characters from Hellboy comics are graphically presented as symbols. These are Hellboy, Prof. Trevor Bruttenholm, Johann Krause, Abe Sapien and Liz Sherman. High value card symbols from Ace to Ten make up the remaining symbols. Hellboy’s oversized famous Fist is the scatter symbol. Hellboy does not offer any progressive jackpot but does offer excellent fixed jackpots. The highest payout is 10,000 coins when five Hellboy Logos line up in an enabled payline. Hellboy offers reasonable betting options. The coin denominations available are 0.01, 0.02, 0.05, 0.10, 0.20 and 0.25. The slot game has 20 paylines and players can wager up to 10 coins per payline. The maximum line bet in credits works out to 2.50 and the maximum total bet to 50.00. Hellboy can be played in the Expert Mode. This mode makes it easier to set the betting options. It also features a very comprehensive Auto Play. The wild symbol substitutes for all symbols except the scatter symbol. It doubles payouts when participating in a winning combination. The scatter symbol offers scatter payouts when two or more of them appear anywhere on the reels. Three or more scatter symbols trigger the Underworld Bonus round. The mission of this round is to locate and secure the hidden relic of power guarded by ferocious beasts. Players have to go through four levels of underground tunnels. Finding team members in each level will award bonus points. However if players enter blocked tunnels then the bonus round will immediately end. On completing all four levels successfully will reach the Chamber of Fire and claim the Relic of Power and additional rewards. 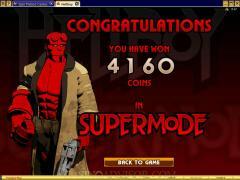 Hellboy also features a randomly triggered Supermode bonus round. This feature awards 10 free spins. The highlight of this feature is that three wild symbols are randomly awarded and then held in place for the 10 spins. This enhances payouts tremendously. The free spins cannot be retriggered. Also the Underworld Bonus round cannot be triggered during Supermode. If Supermode and Underworld Bonus are triggered at the same time the latter is played first. 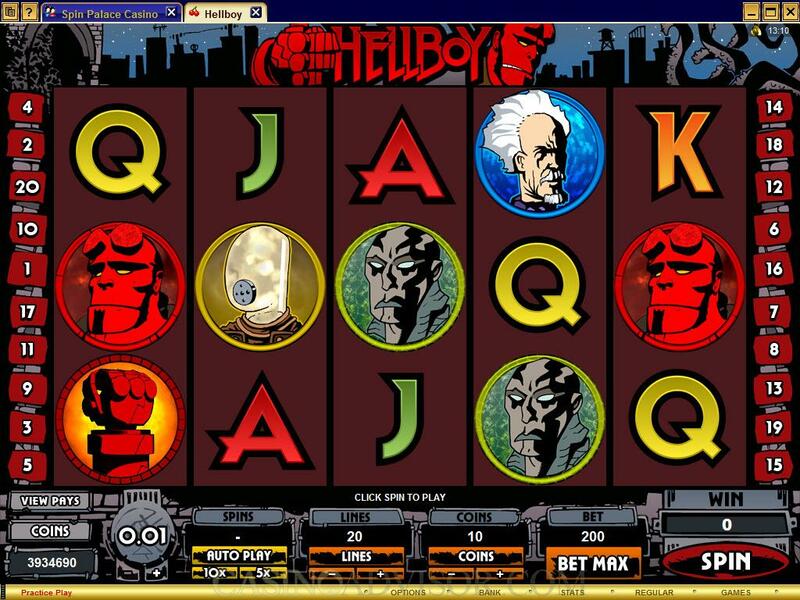 Hellboy also offers the characteristic Microgaming Gamble Game. Players can try to double their payout by guessing the color of the card or try to quadruple their payout by guessing the suit of the card. If players guess correctly they can multiply their payouts, if not they lose their staked amount. The Gamble Game can be repeated till the player loses or till the limit is reached. Interested in reading more detailed information about Hellboy? If so Click Here for more details.